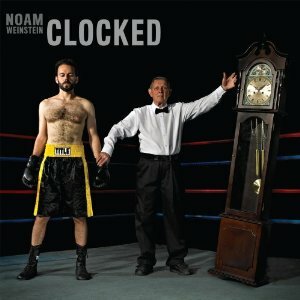 Noam Weinstein takes a page from the Randy Newman, Elvis Costello and Paddy McAloon (Prefab Sprout) style of songwriting–catchy, sophisticated pop songs with clever yet ironic lyrics. It forms the basis of Weinstein’s latest album, Clocked, whose songs are full of melodies and incisive lyrics. There are charming, soulful numbers abound on Clocked ranging from the celebratory “Birthday” to “Healthy”, to the almost punk-inspired “Owe It All” (which is one of those rare songs that makes economic references in the lyrics, such as Fannie Mae) and the cinematic Hollywood. Those upbeat rockers are balanced by some poignant and introspective tunes like the gentle yet pleading “Kill Me Again,” the stark and reflective “Time’s Wider” and the earthy ballad that closes the album, “After a While.” Clocked harkens back to a musical sensibility — i.e. ironic pop –that’s often heard these days anymore. Weinstein has crafted a work that is both quite endearing and thoughtful and will hopefully reach out to a wider audience.